Funeral services for Donald Glen Holman, 86, West Plains, Missouri, will be held at 2:00 p.m., Wednesday, January 30, 2019 at United Free Will Baptist Church, under the direction of Robertson-Drago Funeral Home. Mr. Holman passed away at 3:45 a.m., Saturday, January 26, 2019 at Brooke Haven Health Care. He was born April 4, 1932, at Alton, Missouri, to Johnny Virgil “Pete” Holman and Maureen Josephine Harrison Holman. On October 8, 1953, he was married at Chicago, Illinois, to Clara Martha Peliwo, who preceded him in death on September 5, 2015. Don graduated from Alton High School. Mr. Holman owned and operated a construction business for many years. He was the Presiding Judge of the Howell County Commission from 1983 to 1986 and was elected as the Presiding Commissioner from 1987 to 1990; he was the last judge to serve and the first presiding commissioner elected. 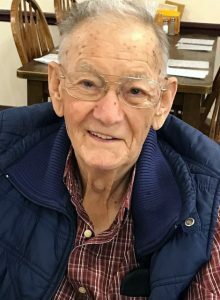 He enjoyed deer hunting, gardening and telling stories. Mr. Holman was a member of United Free Will Baptist Church. He is survived by three children, Glen Holman and wife, Carolyn, Keller, Texas, Karen Friga, Nixa, Missouri and Joyce Holman-Frye, Dora, Missouri; eight grandchildren, Jen Holman, Shawna Bass, Greg Holman, Kelli Leach, Laura Jens, Kayla Lowe, Dane Friga and Matt Roberson; and nine great-grandchildren. His parents, wife and two brothers, Hubert Holman and J. V. Holman, Jr., preceded him in death. Visitation will be held from 6:00 until 8:00 p.m., Tuesday, in the Langston Street Chapel of Robertson-Drago Funeral Home. Burial will be in the Howell Memorial Park Cemetery. Memorial contributions may be made to St. Jude’s Children’s Research Hospital and may be left at Robertson-Drago Funeral Home. Glen, Carolyn and Family, We are so sorry for your loss and wish you strength and peace during this time. Keeping you in our prayers. I want to extend my deepest sympathy to your family upon the loss of Don. Your family is in my daily prayers/thoughts. May God comfort, encourage, and support each one of you thru this difficult time. May God bless you all.